LaJune Harris Justice longtime Ponca City resident passed away Thursday, January11, 2018 with her family by her side. She was 93 years of age. LaJune was born August 3, 1924 in Arkansas City, KS to G.J. and Alberta B. Allin Harris. LaJune will be laid to rest 11 a.m. Tuesday, January 17, 2018 in the Odd Fellows Cemetery of Ponca City, OK. A Celebration of Life will follow at 2:00 p.m. Tuesday, January 17, 2018 in the First Baptist Church Chapel in Ponca City, OK. Visitation will be Monday in the Grace Memorial Chapel Monday from 3 p.m. to 8 p.m. Arrangements are in care of Grace Memorial Chapel. The family has requested memorial donations be made to the Children’s Ministry Department of First Baptist Church of Ponca City, OK. The family wish to say a special thank you to the residents and staff of the Willow Haven Nursing Home and Hospice of North Central Oklahoma. LaJune grew up in Ponca City attending the Ponca City school system and she graduated from Po High in 1941. During the War, she worked as a phone Operator in Ponca City. She met the love of her life George A. Justice and in September of 1946 they were married and made their home in Ponca City. LaJune was a devoted housewife and homemaker being involve with all her children’s activities and interest. LaJune was a member of First Baptist Church and she was very involved in the Children’s ministry department Teaching and Mentoring the young children. LaJune also enjoyed watching old John Wayne movies, reading her bible, cooking for her family. LaJune was also an avid OU Fan. Those left behind to cherish her memories are 3 sons; Larry and wife Debby of Derby, KS, Bill Justice of Ponca City, OK and George Justice of Patchogue, New York. 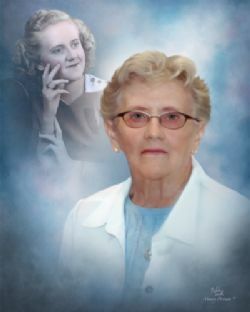 Her daughter Jan Justice of Ponca City, OK. Also surviving are 3 grandchildren: Christopher and wife Liz Justice, Shane Justice and Michal Justice, and 7 great grandchildren; Emily Justice, Bailey Justice, Rylie Justice, Cheyenne Justice, Cole Justice, Allison Justice and Christian Justice. LaJune also had an extended family being Martha Long and her family. She was preceded in death by her parents, Husband George in 1975 and her Brother Rex Harris who died during the Battle of Normandy.